What is infantile hypertrophic pyloric stenosis (IHPS)? 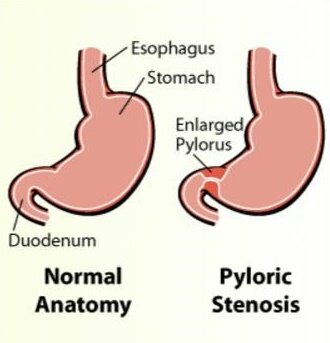 Hypertrophic pyloric stenosis (HPS) is a narrowing of the pylorus muscle. The pylorus is a sphincter (valve) muscle along the end of the stomach that controls the passage of food into the small intestine. When the sphincter becomes hypertrophied (thicker than normal), the opening of the pylorus becomes too narrow for food or liquids to pass through. This leads to excessive non-bilious (not green), projectile (“shooting out”) vomiting. What are the symptoms of IHPS? IHPS is usually diagnosed between two to eight weeks of life. The most common symptom that is observed is worsening vomiting.Projectile, (or forceful shooting) vomiting is the hallmark of IHPS. The vomited fluid consists of formula. The vomiting may be intermittent at first, but will start to occur more often and can become projectile in nature. Your baby may continue to be hungry even after vomiting.If vomiting continues over days, the baby can be dehydrated. The baby may not urinate as often and may not have tears when crying.Blood levels of electrolytes (minerals such as sodium, bicarbonate and potassium) in the blood can be abnormal because of losses during vomiting. IHPS is a relatively common condition that occurs more commonly in first-born male infants. It is believed to occur in approximately 1 in 300 to 900 live births. What are the tests to be done? A small lump (olive like) can be palpated in upper abdomen on right side. A sonography will confirm the diagnosis. Rarely, upper gastrointestinal contrast study is required to confirm the diagnosis. Blood investigations are required to know various biochemical parameters like urea, creatinine, bicarbonate and electrolytes. The child is stabilized with intra venous fluids first. Any dehydration or electrolyte imbalance need to be corrected promptly. The definitive treatment is surgery called ‘pyloromyotomy’. Pyloromyotomy is performed under general anesthesia and involves making a cut through the thickened pyloric muscle while leaving the inside layer intact. This will allow food to pass through the pylorus and into the small intestine. Bleeding, inadequate pyloromyotomy and rarely trauma to nearby organs are the uncommon complications. The child may vomit a few times after the surgery which usually settles within 24 to 48 hours. The long term outcome is excellent.